The first band to perform was Agitator, a kind of Rage Against The Machine inspired band. Although they were the band with most audience/fans presence throughout the weekend, they didn't hit the spot with me. Nor did Raging Speedhorn, the first band to perform on the main stage, who offered music that was much in the same vein. Brainstorm was up next. In my opinion this band deserves more than a slot this early on the day. They make good music, but the tent had a hundred people watching at the most. Must have been a disheartening sight from the stage. 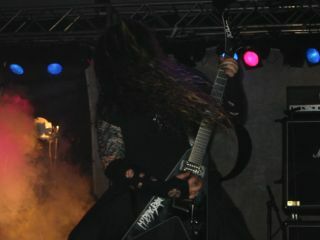 They opened with "Blind Suffering", after which they played a handful of other tracks, mainly from their two recent releases, "Ambiguity" and "Metus Mortis". They did their best, but the audience seemed not really to know what to do. The next band to leave an impression on me was Bigelf. 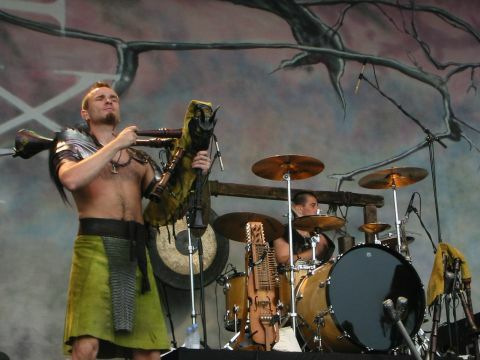 They had been invited to play at Bospop 2001 as well, but somehow hadn't been able to come. I had expected a blues outfit, but in fact they turned out to be a bunch of bearded hippies making 70's rock with a distinct stoner edge. Their singer/guitarist had a couple of keyboards with a range of analog effects equipment that would probably have made electronics students drool. The next interesting (I should say very interesting) band to play was In Extremo, up on the main stage. I had just started to appreciate their latest album, "Sünder Ohne Sügel", and the show just reinforced my opinion. The show was entertaining, high quality, unusual. 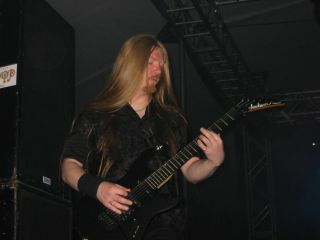 The band played quite a few songs off their latest, among which were "Wind", "Omnia sol Temperat" and "Vollmond". The sound was good, the use of many folk instrument was interesting, and the band presentation/choreography was also pretty cool - including an athletics demonstration, would you believe? It was the first highlight of the day, and in fact a highlight of such quality that it wasn't really beaten by any of the other acts of the day. In Extremo are my major musical discovery of 2002 so far, and their show at Bospop 2002 only made me appreciate them more. 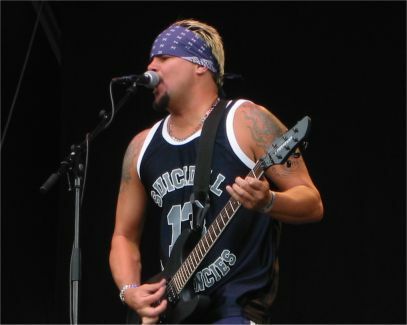 It has been a while since I saw Suicidal Tendencies. I am not exactly a fan of their music, but when they play at festivals and there's no band playing that is more compatible with my personal musical taste, I always check them out. Mike Muir's incessant preaching and insane running about pretty much set the scene for another "you can't bring me down" session of Suicidal. When compared to Suicidal, Moonspell is positively boring. I liked their "Wolfheart" CD but haven't heard (or haven't liked) most of what came before or since. So I was a bit disappointed when they only played one song from my favourite album, but the show as a whole was thorough, professional, restrained and good. I had never heard of Australian Nirvana, but they were quite a surprise: An Australian Nirvana tribute band. Singer Burt Cokain really looks like Kurt Cobain, and really it was just like a Nirvana concert (anyway, that's what I image, having never actually seen the fathers of grunge at work live). The songs sounded incredibly authentic. At the end of the show an old Fender bass, a B-brand electric guitar and the drums bought it. Just like the real thing, probably. 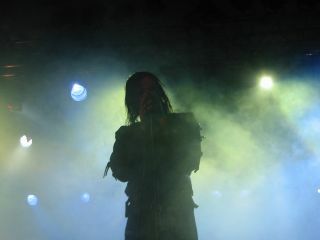 I'd seen My Dying Bride play at Graspop 2002 before, so there was not a whole lot to be surprised at. Again they played about the some stuff as you'd hear on their "The Voice of the Wretched" live CD, again without "Symphonaire". I think they also played "The Raven and The Rose" from their latest studio album. Their new guitarist posed his arse off (looking like he was part of a black metal outfit), the band was spot-on. Another fine MDB show. No surprises, but plenty of quality and a fine selection of songs.